Mr. Dempsey is well-known in the variety show world, and on his first visit to Morecambe he has brought with him a company of capable artists. First and foremost there is the Arthur Saxon trio of strong men, a trio who, a year or two back, astonished visitors at Regent Park with their prodigious feats of strength. Since then the Saxons have been touring through South Africa, where they appeared at Kimberley and even Bulawayo, and afterwards paid a visit to India, returning to England about a month ago. Their strength is remarkable--interest he case of Arthur, phenomenal. On Monday evening they commenced their show with some effective posing, in which 56's were handled almost like the average man would handle a lady's handbag, and then followed astounding feats with heavy bar-bells, which elicited much applause from the audience. To test the genuineness of the weight six or seven members of the audience stepped on to the stage--including a couple of members of the Morecambe Football Club--but the efforts of a powerful-looking raw-boned young fellow were unsuccessful to move the big bar-bell which Arthur Saxon, "the strongest man on earth," afterwards raised with his right arm above his head. Resting on his hands and feet, with his face upwards, he sustained a tremendous weight upon his body, but what pleased the audience most was his last performance. Lying on his back in the middle of the stage, with his head towards the audience, he raised his legs into a perpendicular position, and a long plank was placed upon his feet much in the same fashion as a see-saw. Eight men, averaging probably from 12 to 15 stone per man, were lifted on to the plank, and when they had got nicely settled with legs dangling in the air, and their bags to the audience, the strong man lifted up a huge barbell with his hands, and held it at arms' length, parallel with the plank. Three men sat upon the barbell, and for a considerable time the weight of the eleven men and the bar was sustained by his arms and legs. On ridding himself of his human burden, and rising to his feet, Arthur Saxon received a great ovation, and he certainly deserved it. The trio do many astounding feats of strength which most people would deem impossible unless they witnessed them. 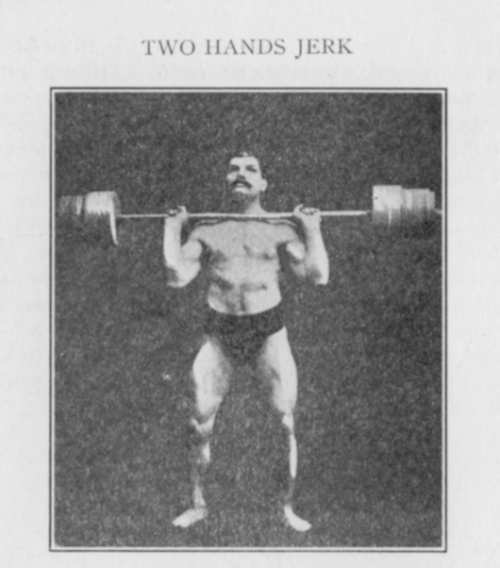 The Arthur Saxon trio, while appearing at the Westminster Music Hall, Liverpool, were invited by the Liverpool Weight-lifting Club to lift (if they could) a very heavy and awkward bar-bell, tried by nearly all of the strong men of the day. The first to try was Adolf Saxon, who, without taking his coat off, immediately hoisted the bar-bell three times above his head with two hands. This was very much appreciated, but afterwards came Arthur Saxon, who lifted the barbell with one hand, then juggled it to the other, a marvellous feat of strength. The weight of this bar-bell is 286 lbs. (weighed). It can be tested at any time. After seeing this we thoroughly believe in Arthur Saxon's world's record of 325 lbs. with the right hand and 411 lbs. with two hands. After seeing the phenomenal feats of strength with this bar-bell, the Club decided to see the Saxons' performance the same night. They were "paralysed" by the phenomenal feats accomplished. The concluding feat, in which Arthur Saxon holds fifteen men and weights on his hands and feet, is something to be remembered. We suppose this will be read by nearly all the prominent weight-lifters of England, who, if at any time in Liverpool, we shall be only too pleased to see. Let them try to lift the barbell! Ted Reece, Instructor; R. Churchill; R. A. Fieldhouse; Oscar Hilginfeldt; John Reuter; Thos. Sale; J. Sale; A. Bibby; F. Petersen Club Headquarters, 41a Prescott Street, Liverpool.